It’s as predictable as the tide. Every morning, thousands of commuters stream down the Central Mid-Levels escalator, bound for offices, buses and crowded subway cars at the bottom of the hill. Then, at 10:30am, the escalator reverses itself. Now the crowds flow uphill. Helpers return from the market with bags full of choi, the lunch crowd trickles up to Soho restaurants. When evening arrives, work-weary commuters are carried up to drink, dinner and bed. Nearly two decades after the completion of the Central-Mid-Levels escalator, it’s hard to think of Hong Kong without it. 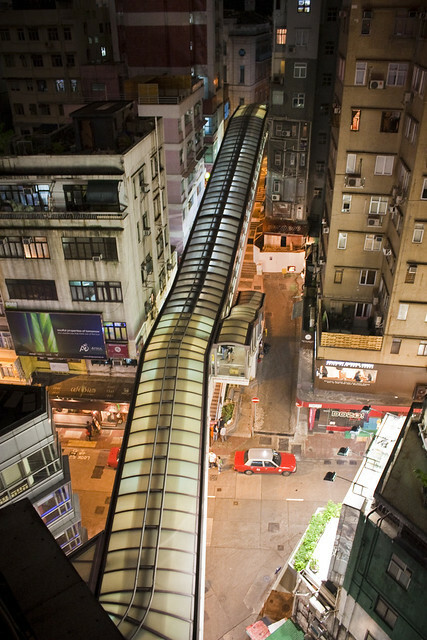 Its network of covered escalators, moving walkways and footbridges spans a distance of 800 metres from Queen’s Road Central to Conduit Road, making the trek up steep hillsides—135 metres in elevation from bottom to top, about the same as a 40-storey building—as easy as a walk through a shopping mall. It’s certainly popular. When it opened in 1993, the escalator was expected to carry 26,000 people per day. It is now used by nearly 43,000. Its popularity with pedestrians has prompted the government to plan similar escalator links in 20 other locations around Hong Kong. The first of these will open later this year on Centre Street in Sai Ying Pun, while another escalator, on Pound Lane in Sheung Wan, is being planned. These are the questions being raised by residents and business owners in the sleepy neighbourhood around Pound Lane, where the government is planning to build a 200-metre escalator from Tai Ping Shan Street to Bonham Road. Along the way, it will pass by Hong Kong’s first public toilet, schools, temples, tenements and Blake Garden, Hong Kong’s oldest public park, which was built after the bubonic plague swept through the area in 1894, killing more than 3,000. Proponents say it will reduce traffic and provide relief to the neighbourhood’s many elderly residents. Opponents say it will destroy the peaceful, low-key ambiance that sets this part of Sheung Wan apart from the development frenzy of Central and the Mid-Levels. The escalator’s critics say it would do more harm than good. Pound Lane is a narrow street, and the escalator would require much of it to be demolished and rebuilt. 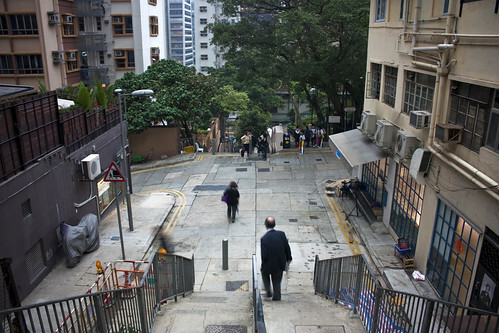 As a result, it would cost far more than other escalator links: HK$200 million, according to the latest government estimate, compared to $60 million for Centre Street. Many of the street’s trees would be chopped down, including those on a portion of Blake Garden that would be paved over to serve as a driveway for cars blocked by the escalator. Critics also point out that the MTR’s new Sai Ying Pun station, slated to open in 2014, will offer an uphill elevator link about 400 metres from Pound Lane. Central and Western District Concern Group founder Katty Law, who lives on Caine Road and runs a small pottery studio next to Pound Lane, is even more blunt in her assessment: “This is really a very bad idea,” she says. 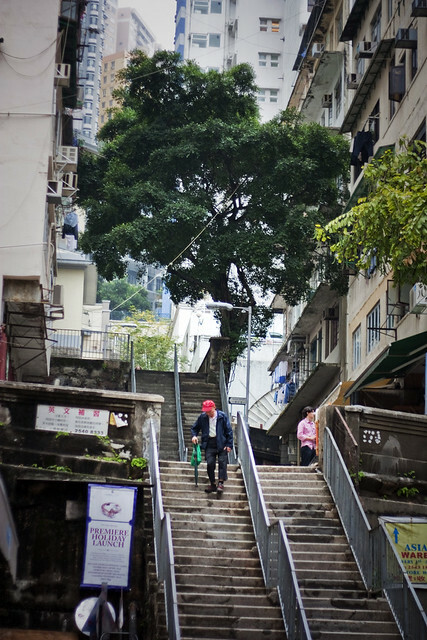 “It’s a common sentiment among district councillors that any infrastructure spending is good, but they haven’t considered the bigger picture of whether there are ways to improve connectivity without damaging the environment.” She suggests working with the nearby Tung Wah Hospital to build a lift or escalator for those who struggle to get uphill. What worries many of the escalator’s critics is that the history of the Central Mid-Levels escalator will be repeated. When it was first planned in the 1980s, the government billed it as a way to reduce traffic congestion in the Mid-Levels. Instead, it actually worsened congestion – drivers and taxi commuters didn’t change their habits, and the new escalator encouraged residential and commercial development along its path. In 1996, three years after it opened, the government’s Director of Audit declared the escalator “a costly white elephant” that had failed to achieve its objectives. Gentrification has spread to the neighbourhood around Pound Lane, too. In fact, many of its businesses are galleries and boutiques that have fled the high rents further east, like art dealer Sin Sin, who moved her namesake gallery to the area in 2005, after being priced out of Central. When she learned of the proposed escalator last year, she said she feared it would replicate what happened in Soho. “If it gets to be like that, that’s the time I move out,” she said. 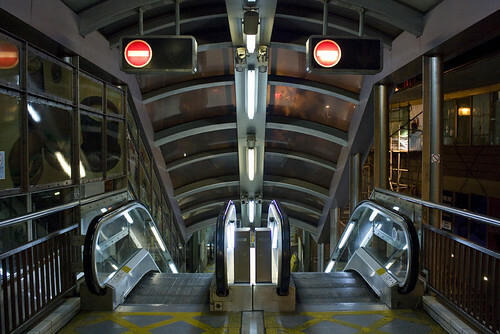 A consultant report commissioned by the government in 2010 projected that the Pound Lane escalator would be ultimately used by 29,000 people per day, compared to 1,200 who currently walk along the street. It would “not change the car owner’s driving habit” and would have no effect on reducing road congestion in the Mid-Levels. As with the Central-Mid-Levels escalator, however, property developers are taking an interest in Pound Lane. Richfield Realty, a company that buys up old properties on behalf of major developers, has opened an office nearby, and it has already made attempts to acquire apartments along the escalator’s proposed path. 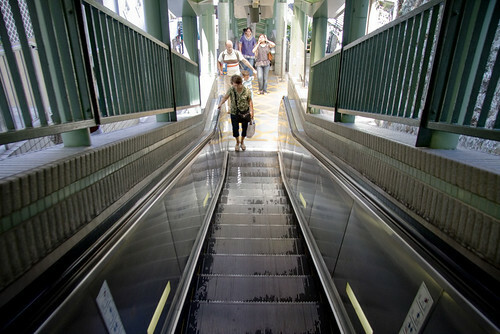 This July, a study will begin to determine the final design of the proposed escalator. It will be put up for public consultation later this year. Siu says she is convinced that most residents support the plan, but Law says otherwise. She and her supporters are planning to ramp up opposition to the escalator. This entry was written by Christopher DeWolf , posted on Wednesday April 25 2012at 10:04 pm , filed under Asia Pacific, Heritage and Preservation, Public Space, Transportation and tagged Development, Escalator, Gentrification, Hong Kong, Redevelopment, Urban Design . Bookmark the permalink . Post a comment below or leave a trackback: Trackback URL. This project is an engineering feat, there is none by comparison. I want to visit it when it is completed.